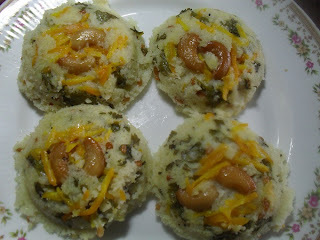 Chitra Amma's Kitchen: What To Cook For Varamahalakshmi Pooja - Ravae Idly - Steamed Semolina Dumplings. 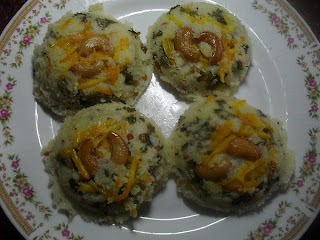 What To Cook For Varamahalakshmi Pooja - Ravae Idly - Steamed Semolina Dumplings. Ravae idly / steamed semolina dumpling, a signature dish born in the hygienic kitchen of the renowned MTR is a favourite of all South Indian homes. MTR's Instant Rava Idli Mix is a hit among the novices and the experienced home cooks alike. This healthy and delicious idly is also prepared from scratch in many homes. Rice Idlies are prepared and offered to the Goddess on Varamahalakshmi pooja day along with the other customary dishes. Ragi idly, Semiya idly, Kaancheepuram idly and Ravae idly will also suit the purpose. 1. Heat oil in a thick bottomed pan and add mustard seeds. 2. When the mustard seeds splutter add black gram dal and bengal gram dal. 3. When the dal becomes golden yellow in colour add curry leaves and half of the cashew nuts and roast till golden in colour. 4. Add Ravae, decrease flame and roast till it gives out a pleasant aroma. 5. Switch off flame , set it aside in a bowl and let it cool. 6. Mix in chopped green chillies, chopped ginger, chopped coriander and salt to the curd and blend with the roasted and cooled ravae. 7. 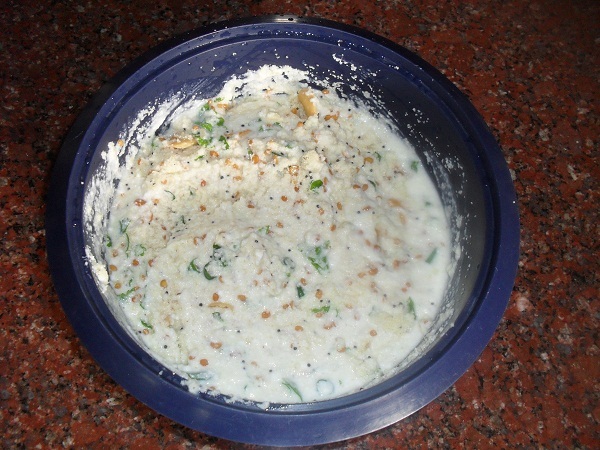 Let the ravae soak in the curd for about fifteen minutes. 8. In the mean time grease the idly plates using ghee. 9. Roast the remaining cashew nuts in ghee. 10. Line the greased plates with roasted cashew nuts and grated carrots. 11. 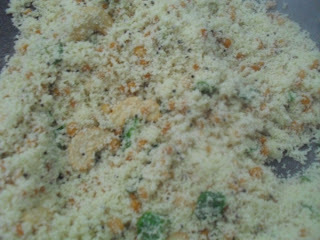 Add little water to the now hardened ravae and curd mixture, and loosen the batter. 12. Mix in the cooking soda and pour one ladle of batter in each of the carrot and cashew lined depression of the idly plates. The batter should not sit like a lump but should be just loose enough to fill in the idly plates. 13. Steam in a pressure cooker without the weight for ten minutes. 14. Decrease flame and steam for five more minutes. 15. Switch off flame and scoop out the delicious ravae idlies after fifteen minutes. Offer the soft and spongy Ravae Idlies to Varamahalakshmi and savour the flavoursome prasaadam. Love this idli... Thanks for the recipe.God bless.